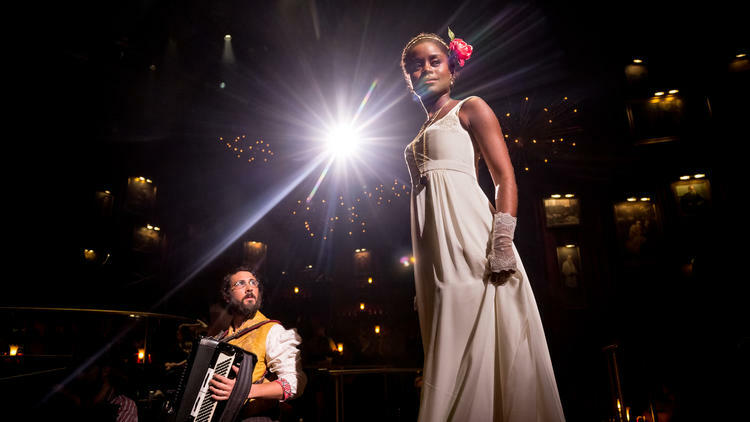 You heard me chat about these two musicals on the radio when they opened last fall, but a new year has rolled in and Natasha, Pierre and the Great Comet of 1812 and In Transit are still two of the most new and innovative shows to grace the Broadway stage in 2017.
with full houses at the Imperial Theatre each week. What's interesting about this celebrity casting, however, is that Groban's role isn't what we would think of as the star. It's a prominent role, but in scope of things, the popular singer, who first came to attention on the TV show Ally McBeal, doesn't get a lot of solos or opportunities to wow with rich baritone (though one ballad. "Dust and Ashes" -- see video below-- has become the tune associated with the show). The show won the 2013 Richard Rodgers Award for Musical Theatre and the Off-Broadway version received numerous nominations. In another innovative twist, the show is inviting fans to join composer Dave Malloy and members of the cast to sing group chorus sections and to play the show's famous egg shakers for the original Broadway cast recording. This special fan recording session will take place in midtown Manhattan on Monday, Feb. 13 from 6 to 7:30 pm. No purchase is necessary – to sign up, and receive the exact location visit www.greatcometbroadway.com/castrecording. Meanwhile, over at Circle in the Square, In Transit, with music by a team including the creators of "Pitch Perfect" and "Frozen," is Broadway's first a cappella musical. There is some unique staging by one of my favorite set designers, Donyale Werle, to create the subway world of New York. 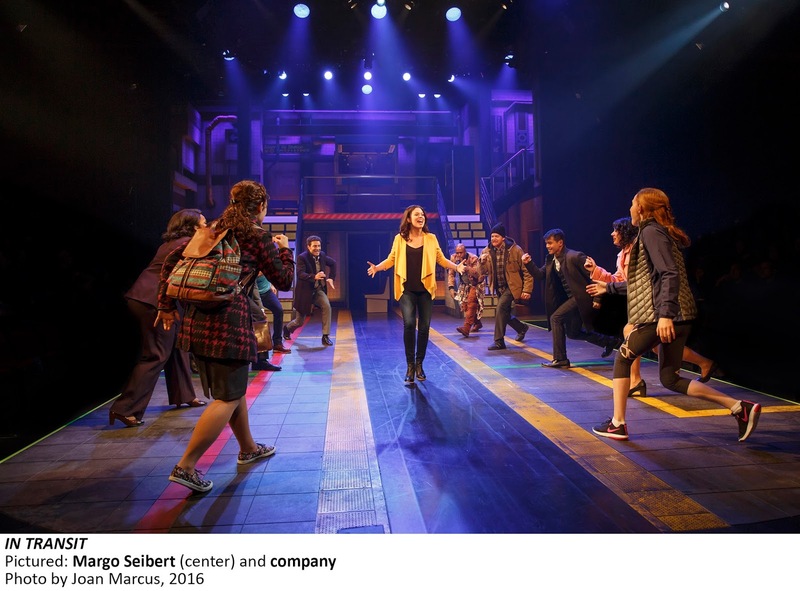 The ensemble includes Broadway vets Margo Seibert and Telly Leung, but doesn't include a Hollywood name -- except maybe for composer Kristen Anderson-Lopez whom you know even if you don't know her name. She is the one who brought you "Let it Go" from the animated film "Frozen," sung by Idina Menzel. At any rate these two musicals offer something different and that is always exciting on Broadway stages. See below for more specifics. Russian music plays as audience members take in the fact that the whole theater seems to be a stage and they are on it. Audience members actually sit on the stage and platforms bring actors out into the house. You're not safe from interaction up in the mezzanine either, as stairs provide access there from the stage. You might be handed a rattling egg to shake during a musical number or a pirogi to snack on. You also might find yourself being nuzzled by Anatole (this was my personal experience while seated on stage). The story, taken from a couple of chapters of Tolstoy's epic novel, follows the scandalous romance of Natasha (Denée Benton , also making her Broadway debut) and womanizer Anatole (Lucas Steele, reprising the role for which he won a Lucille Lortel Award) just before Napoleon's invasion of Russia. Groban is Pierre, an outcast, disillusioned aristocrat, unhappily married to Anatole's sister, Hélène (Amber Gray). Director Rachel Chavkin distinguishes herself as one of the upcoming directors on stage (this one stunningly created by Mimi Lien who partners with Costume Designer Paloma Young to bring 19th-Century Russia to life.) You can't imagine how completely Chavkin shatters the fourth wall here without experiencing it for yourself. While I felt the chaos was a bit too much for me in places, the sheer genius of creating the scene still impressed. Small moments also aren't lost in the midst of putting the huge ensemble through what must be a grueling workout (choreography is by Sam Pinkleton). In one scene, for example, snow falls directly on one character instead of on the whole stage, or on the whole theater, which is what we might be expecting given the scope of the interactive commotion taking place. The result is a moving moment that might otherwise have been lost. Similar effects are achieved through expert Lighting Design by Bradley King. Bright lights and solo highlights mix nicely. The highlight for me personally is "Sonya Alone," a haunting ballad of loyalty sing by Natasha's betrayed and abandoned friend, Sonya (an excellent Brittain Ashford). Goosbumps. "I will stand in the dark for you. I will hold you up by force. I will stand here right outside your door. I won't see you disgraced." It's a sensory overload. It's like having a video game explode all around you. I have seen this show three times-- once Off-Broadway in the intimate tent setting -- and twice on Broadway, once on stage and once in the house. The orchestra seat provided a little less interaction, which I preferred, but the seat on stage provided the best vantage point to take in everything that was happening. At two and a half hours, it's way too long (but then again, we are talking "War and Peace....") I didn't think the energy level could get any higher, but the second act blew it off the charts. It's just a lot to take in. If you have ADD, this probably isn't the show for you. Natasha, Pierre and the Great Comet of 1812 plays at the Imperial Theatre, 249 West 45th St., NYC. greatcometbroadway.com. Sonya,’ Gelsey Bell as Mary, Nicholas Belton as Andrey/Bolkonsky, Nick Choksi as Dolokhov, Grace McLean as Marya D, Paul Pinto as Balaga.The ensemble includes Sumayya Ali, Courtney Bassett, Josh Canfield, Ken Clark, Erica Dorfler, Lulu Fall, Ashley Pérez Flanagan, Paloma Garcia-Lee, Nick Gaswirth, Alex Gibson, Billy Joe Kiessling, Mary Spencer Knapp, Reed Luplau, Brandt Martinez, Andrew Mayer, Azudi Onyejekwe, Pearl Rhein, Heath Saunders, Ani Taj, Cathryn Wake, Katrina Yaukey, and Lauren Zakrin. Sound Design by Nicholas Pope, Music Supervision by Sonny Paladino, Musical Direction by Or Matias. -- No specific notes, but I would say this story probably is for 12 and up. It's a ride -- literally -- through life, career and family. The story follows the intertwined lives of 11 New Yorkers. Seibert plays Jane, a wanna-be actress who is stuck in office jobs waiting for her big break. Leung plays the boyfriend of Jane's agent, Trent (Justin Guarini), who is unable to reveal to his fundamentally religious mother (Moya Angela) that Steven is more than just his roommate. Nate (James Snyder) is a down-on-his-luck businessman who also is down to his last dollar, which won't even buy him a metro card. His sister, Ali (Erin Mackey), has just been dumped by the guy for whom she moved to New York. There are some other stories in there and a few smaller roles, like an unhelpful ticket agent, that are amusing. The things that make this show different are the set, which allows us to feel like we're on a subway car, and the a cappella score. That set. It transforms from a subway station to a church. A people-mover conveyor belt provides the train motion. This one clocks in at about 90 minutes with no intermission. I found it likable with humor for those of us who brave New York City transit. Group a cappella numbers are so strong that it makes it easy to forget there are no musical instruments playing (Music Supervision by Rick Hip-Flores). The book is fairly predictable. The a cappella arrangements (by Deke Sharon) sometimes make it very difficult to hear the lyrics. Costume Design by Clint Ramos, Lighting Design by Donald Holderand, Sound Design by Ken Travis. David Abeles, Steven “HeaveN” Cantor, Gerianne Pérez, Chesney Snow, Mariand Torres and Nicholas Ward.